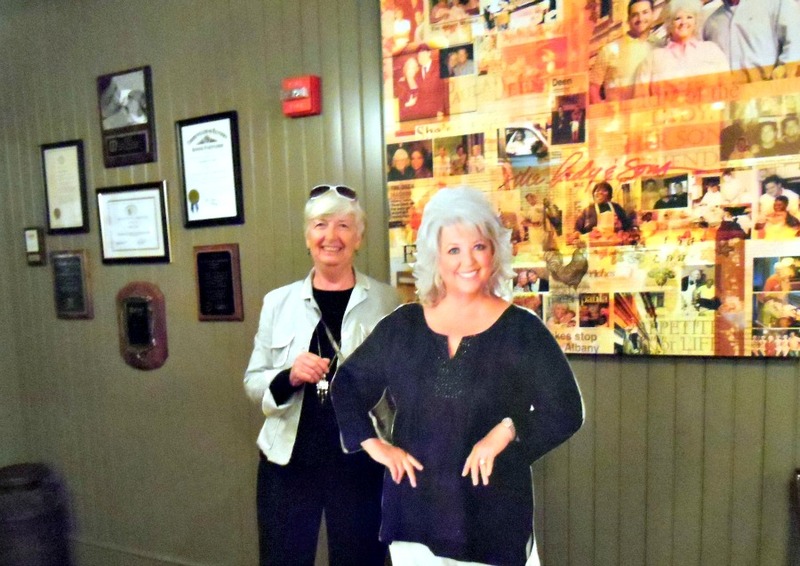 "As a young girl growing up in Albany, Georgia, Paula Deen never dreamed she would become an American icon. As a young mother, Paula was living the American dream—married to her high school sweetheart, raising two adorable boys; when tragedy struck. Her parents died, her marriage failed and she began a prolonged battle with agoraphobia. With her boys in their teens and her family near homelessness, Paula took her last $200, reached deep inside her soul and started “The Bag Lady,” a home-based catering company that marked the start of Deen’s professional cooking. 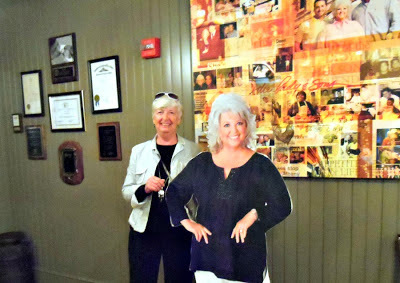 With sons Jamie and Bobby delivering “lunch-and-love-in-a-bag,” beginning in June 1989, Paula turned around her life by sharing what she knew best, traditional Southern cooking". 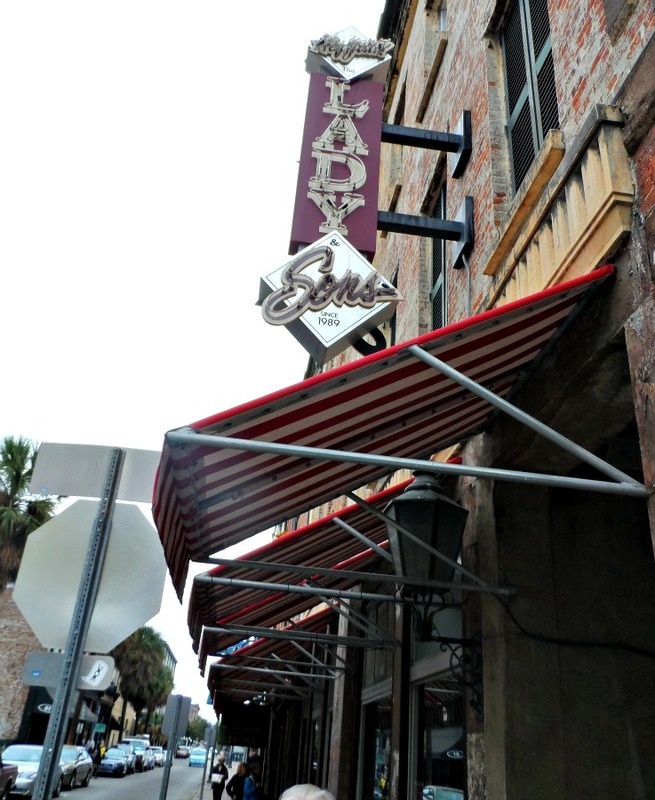 So nothing would do but we had to go to "Lady and Sons" for lunch while in Savannah. We were in Savannah one day exploring the city and decided to check the restaurant out and find out the process for booking a reservation. I'm glad we did that. The exterior of the restaurant was pretty inconspicuous - I'm not sure why, but I expected something more splashy - and we had trouble finding it. If you are in Savannah and want to eat there I recommend you make a reservation - people who did not were waiting an hour and a half for a table. So we reserved for lunch in two days time. A cardboard cut-out of course, but what the hey - it's the thought that counts :). Our name was called very quickly and we were sent to an elevator to go to the third floor. As we learned there are three floors in the building. Floor 1 is the store and restaurant, floor 2 the kitchen, and floor 3 more restaurant and a very cozy looking bar. 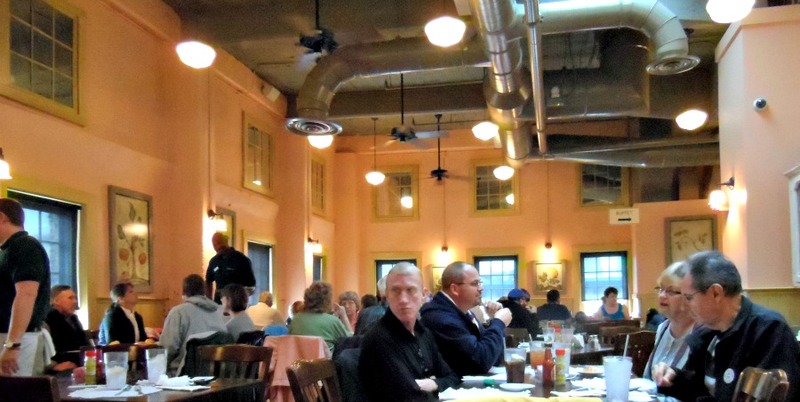 The interior of the restaurant is very austere and utilitarian in décor. But that works in an old building. 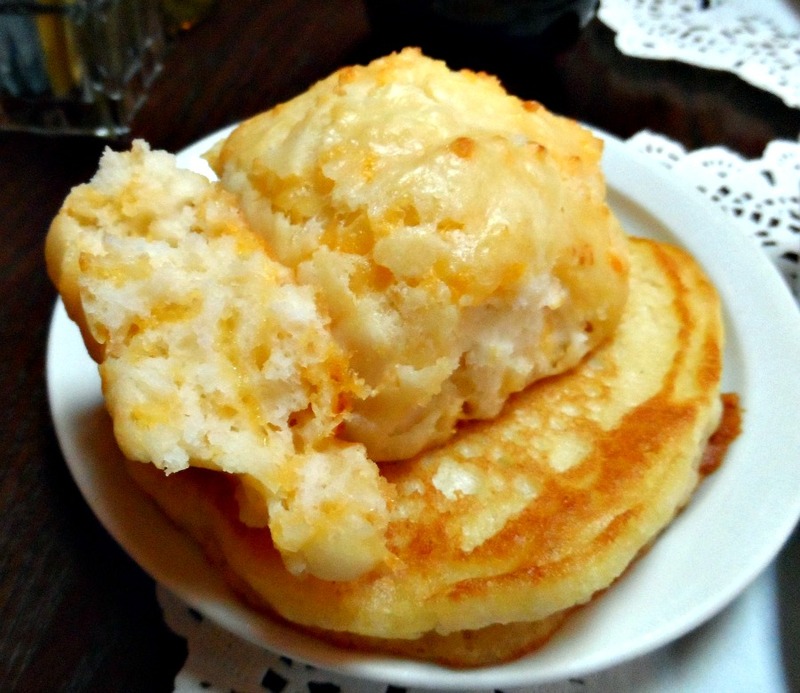 Immediately as we were seated small plates with a pancake and a cheese tea biscuit were placed on the table. To be eaten dipped in maple syrup that was already on the table. They were both very tender and delicious. And no need for butter - there was likely enough in the biscuit to butter 6 pieces of toast. For lunch they feature a buffet offering a huge selection of southern foods - fried chicken, tomato pie, creamed corn and so much more. Between the bright lighting and the glass sneeze bar I could not get a good picture. We decided to pass on the buffet and order from the menu. 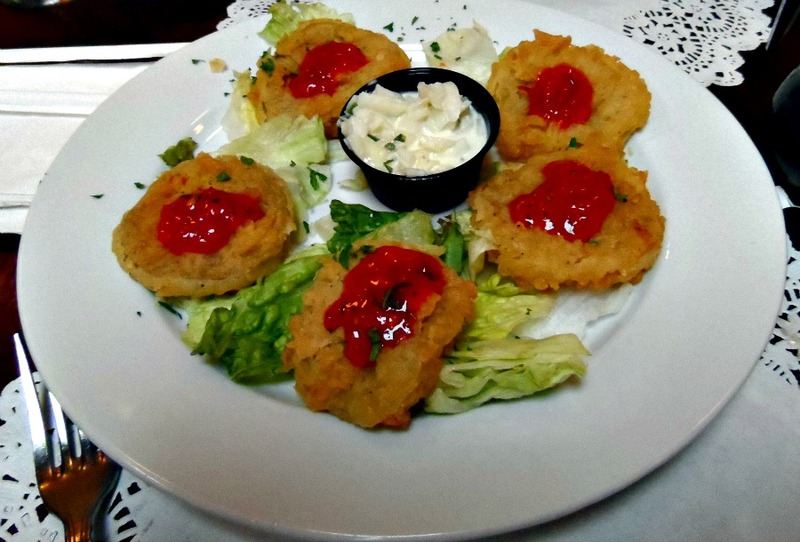 To start we shared a plate of fried green tomatoes. Served with Vidalia onion relish and roasted red pepper sauce they were delicious. The batter was light and perfectly cooked, not greasy. Then we ordered two sandwiches. 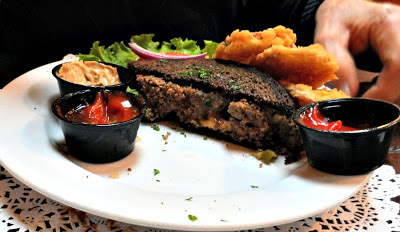 Arch had the Savannah meatloaf sandwich with wild mushroom mayonnaise. It was a huge piece of meatloaf on pumpernicklel accompanied with three dips - regular ketchup, southern ketchup and southern mustard (both very sweet). 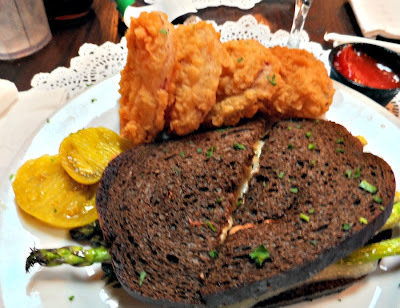 I had the asparagus sandwich, also on pumpernickel topped with red onion, jack cheese and thousand island dressing. Everything was very good, but a lot of food, so we passed on desert. And the bill was very reasonable - about the same as you would pay in any restaurant. Which was a pleasant change - usually when we go to restaurants bearing the name of a well known chef, and receiving the associated publicity, the prices are outlandish. Thank you, Paula. We were told that the restaurant does 500,000 covers a year at, I estimate, an average of $25 per cover - you do the math.